With the launch its Pulse-cutting Band-saws, Amada is claiming the most revolutionary bandsaw development in half a century. The new design dramatically reduces production times, blade chattering and excessive noise levels. 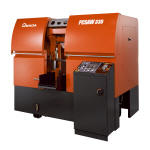 The Amada PCSAW330 and Amada PCSAW700 machines are the world’s first band-saws to control the blade with a unique pulse cutting system which provides a much smoother sawing action and allows the saw to operate with a cutting speed twice as fast as conventional band- saws. Wear on standard M42 bi-metal saw blades is reduced by as much as 50 per cent and sound levels are kept down to an environmentally friendly ‘hum’. 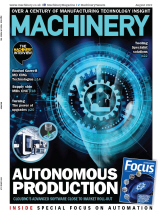 Amada migrated punch–press technology to its band saws to achieve this feat. The pulse-cutting concept uses a special high-powered servomotor to power the saw’s driving wheel and control the motion of the blade. In effect, the induced level of oscillation provided by the servomotor is applied in direct opposition to the chattering of the blade to create zero vibration in the cutting zone For example, when using a high-speed blade to pulse-cut a 304 stainless steel bar of 400 mm diameter, the machine is capable of cutting in 8.5 minute. Indeed, with cutting resistance reduced by 40 per cent in the downward direction, the sawing action of these new machines is “probably the fastest in the world” and - depending on the type of material to be cut - recommended cutting speeds can be twice as fast as band-saw currently available.